As part of its new Hand Proprioception and Touch Interfaces (HAPTIX) program, DARPA has selected several research initiatives for funding awards. The goal of HAPTIX is to develop prosthetic limbs that feel and function like natural limbs for amputees — veterans in particular. Each recipient in this current round of funding is focused on prosthetic electrodes that interface with a patient’s biology to control or sense the device. Though advances in robotic prostheses are rapidly accelerating, there is still much work to be done. Effective user control of these prosthetics has been particularly challenging, and a number of methods have been attempted with limited success. Transcutaneous leads that interface with nerves under the skin have been used, as have other designs with leads that sense the muscular twitching in a stump. In addition to conquering the control issues, a relatively recent goal has been to restore a sense of touch to the amputee through sensors that are part of the prosthetic limb. Sophisticated encoding and decoding algorithms to transform recorded volitional motor control signals into limb movements, and patterned stimulation into naturalistic touch and proprioceptive sensations. 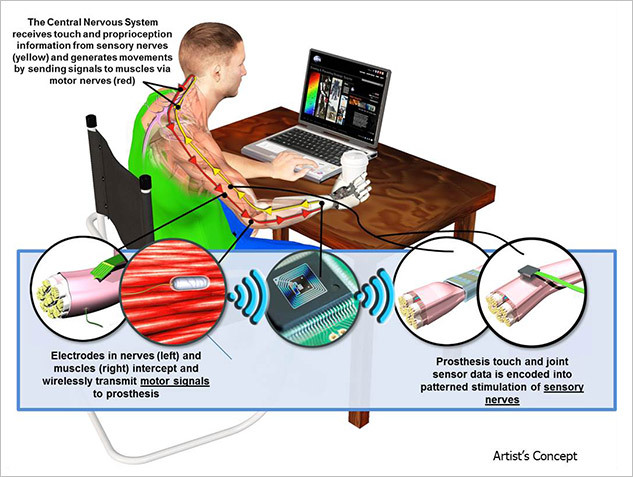 Implantable Myoelectric Recording Array for Control of Prostheses, awarded to Ripple LLC in Salt Lake City, Utah. Ripple’s technology is an implantable wireless device that aims to increase reliability of prosthetic limbs and create a more natural movement. Currently, surface electrodes provide slow and poorly controlled movements. Wireless interface will be achieved with the attached prosthetic, and implantation is minimally invasive. Multisite Intrafascicular Stimulation for Stance, awarded to Richard A. Normann, Ph.D., of the University of Utah in Salt Lake City. Normann has developed the Utah Slanted Electrode Array (USEA), which provides more uniform coverage to peripheral nerves when implanted within them. The USEA can communicate with nerve fibers and receive information from many of them at a time, then translate output to only a select few. This provides smooth and specific movements of muscles that are more natural, while generating minimal fatigue. Enhancing Neuroprosthesis Performance with Nerve Cuff Electrodes, awarded to Dustin Tyler, PhD at Case Western Reserve University. Tyler has designed and tested high-density electrode nerve cuffs in patients suffering from injured spinal chords. Wrapping around major nerves in the limbs, the cuffs stimulate these nerves, inducing movement in the limb, which can be used to drive prosthetics. The sensors will also be used to stimulate sensations in sensory nerves, thus providing artificial sensory input to the patient.